The past two weeks have brought some exciting changes into my life. I’ve finished up a few knitting projects (pictures to come! 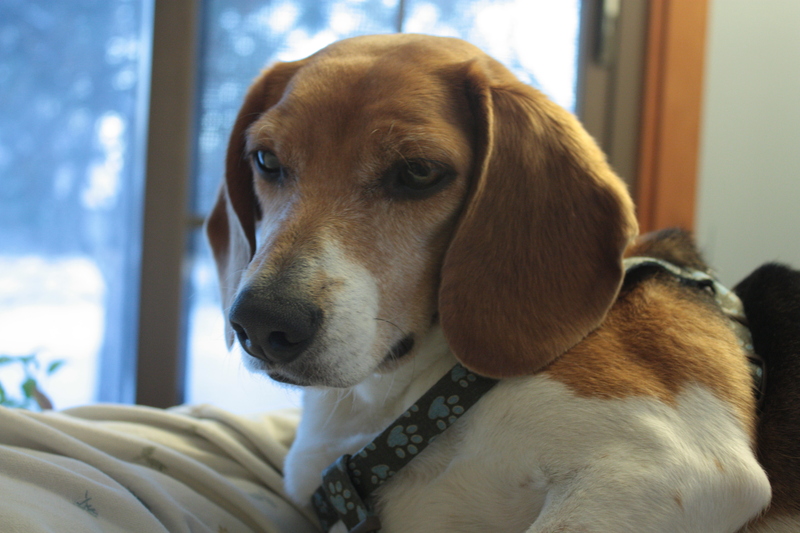 ), my husband and I started building a new hutch for our pet rabbit, Clark, and we’ve adopted a new dog. This little girl is Molly. We found her wandering through our yard a few days ago, dehydrated, full of fleas, and without any identification. We took her in just hours before the weather turned nasty (rain first, followed closely by snow and freezing temps). The owner that her microchip was registered to died quite some time ago. Where has she been since then? Who knows? What we do know is that she has captured our hearts and found her forever home. Well, enough about cute puppies–let’s move on to the knitting, shall we? The “bulletproof” mittens that I made for my husband some years ago have finally bitten the dust. 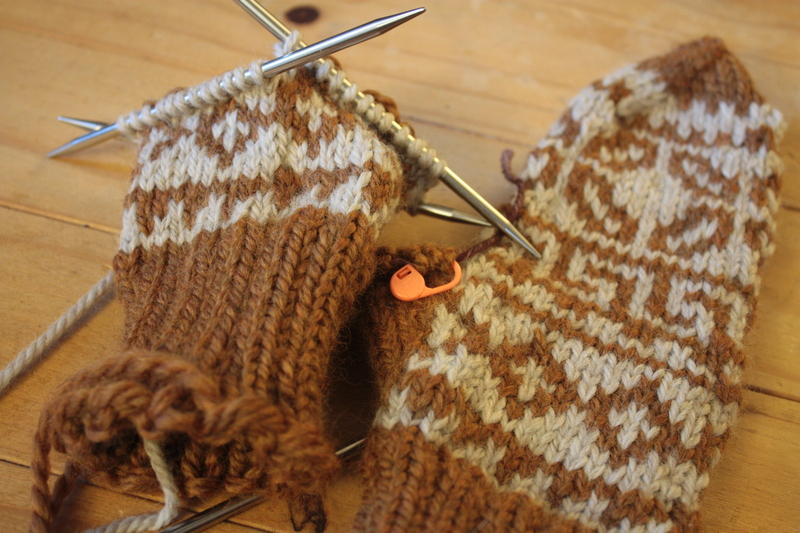 They had a long and useful life, so I’ve decided to make him another pair using the same pattern (Bulky-Weight Andean Mittens from Marcia Lewandowski’s Folk Mittens). I’m using US 7 needles and some Peruvia Quick and Galway Chunky that I had hanging out in the stash. Almost done! 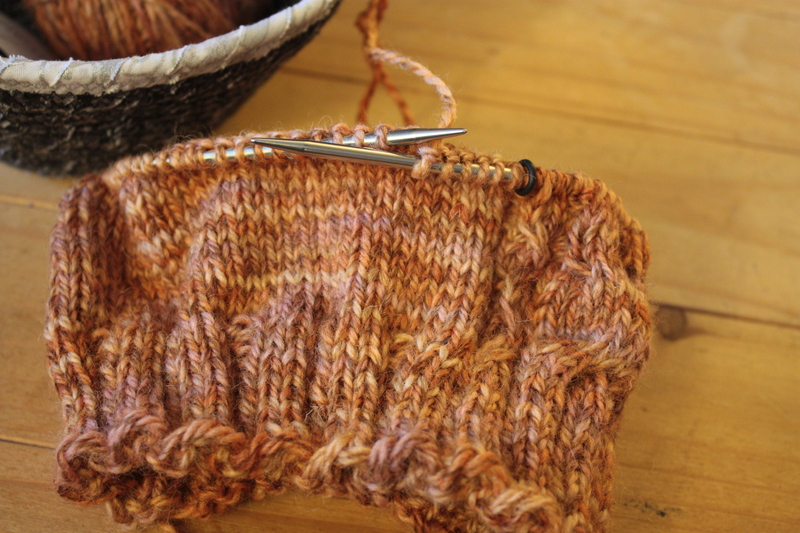 The hat that I started last week is being very patient, out of consideration for the recent mitten crisis. And last but not least, I’m going to wind these babies up tonight in preparation for my 2016 shawl. As some of you may already know, the very first shawl I ever made was started on January 2nd, and it is now my personal tradition to start a shawl every year on that date. 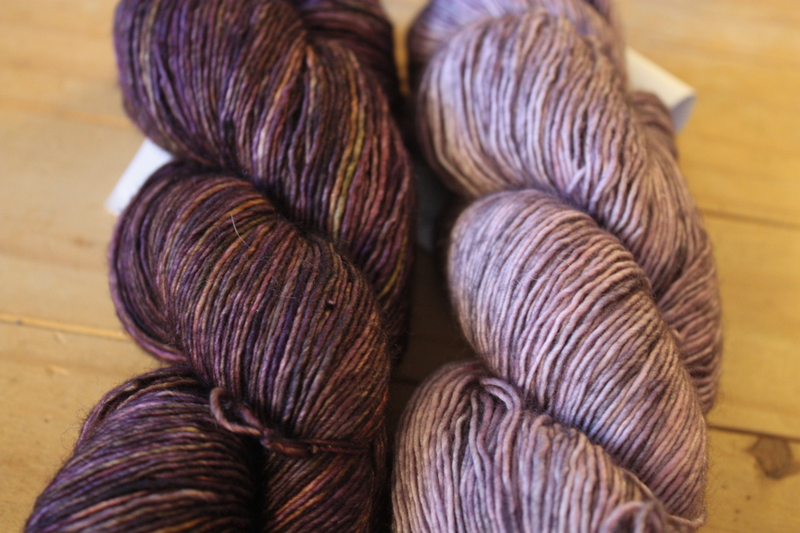 These are Tosh Merino Light in Wicked and Nightbloom (both of which are now discontinued, I believe), and they’re going to be made into Whippoorwill, by Carina Spencer. I can’t wait! Well, that all, folks! Tune in next week to see what’s happening around the cottage. Until then, take care and happy knitting! How kind of you to take in Molly! I’m so glad she found a home–must’ve been a shock to her to lose her previous owner. Glad Teddy now has a buddy. And those mittens are gorgeous! Your hubby’s lucky! Lastly, those TMLs are stunning together! Looking forward to seeing the finished shawl! Happy New Year! Enjoyed “Around the Cottage” very much!! Fate!! Your puppy found you! I’ve been enjoying your blog! You are a very talented writer……as well as knitter. 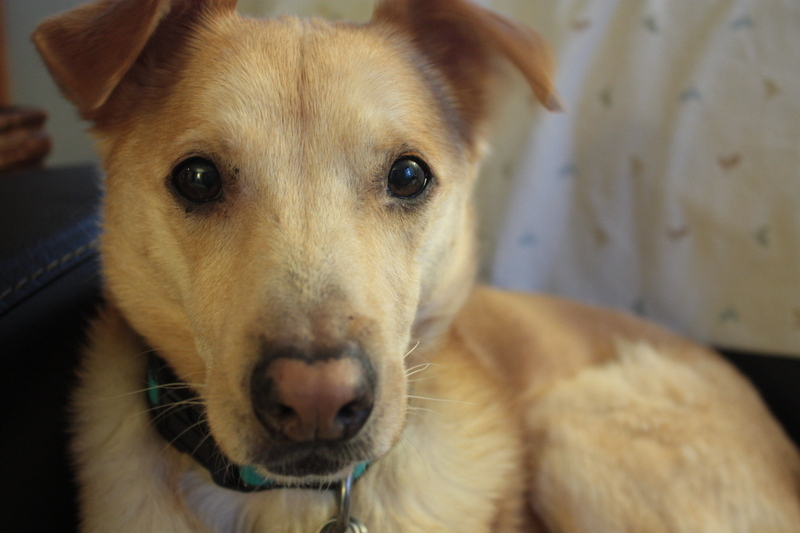 Dogs really do make the world go ’round. Where would we be without them! I look forward to seeing more pix at knitting class! !